Last month I shared my interview with one of the developers over at Buzz Bee Toys. We featured Buzz Bee's Adventure Force Blaster. This month I have a new blaster to show you from Buzz Bee Toys. This is the Air Warriors Covert Squad Dart Blaster. It comes with 2 blasters, 8 foam dart, 2 sets of airbuds. These dart blasters have built in walkie talkies, so you can communicate with your partner. The blasters require (3) AA batteries. They are not included. The walkie talkie feature is activated by a small switch on the bottom of the blaster. You can use the walkie talkie with or without the airbuds that are included. There are 2 channels to choose from, red and green. This way if you are playing with another team, they can use one channel and you can use the other. Loading the Air Warriors Covert Squad dart blaster is so simple. Just lift and pull the orange lever back and load. The blaster takes one dart at a time. It has a pretty good trajectory of up to about 100 feet in distance. I love that the Air Warriors Covert Squad dart blasters come in a pair. It makes sense that it should be sold that way. This is great for parents who want to save money and it also encourages kids to go play with others. You can purchase the Air Warriors Covert Squad Dart Blasters at Target for less than $25. 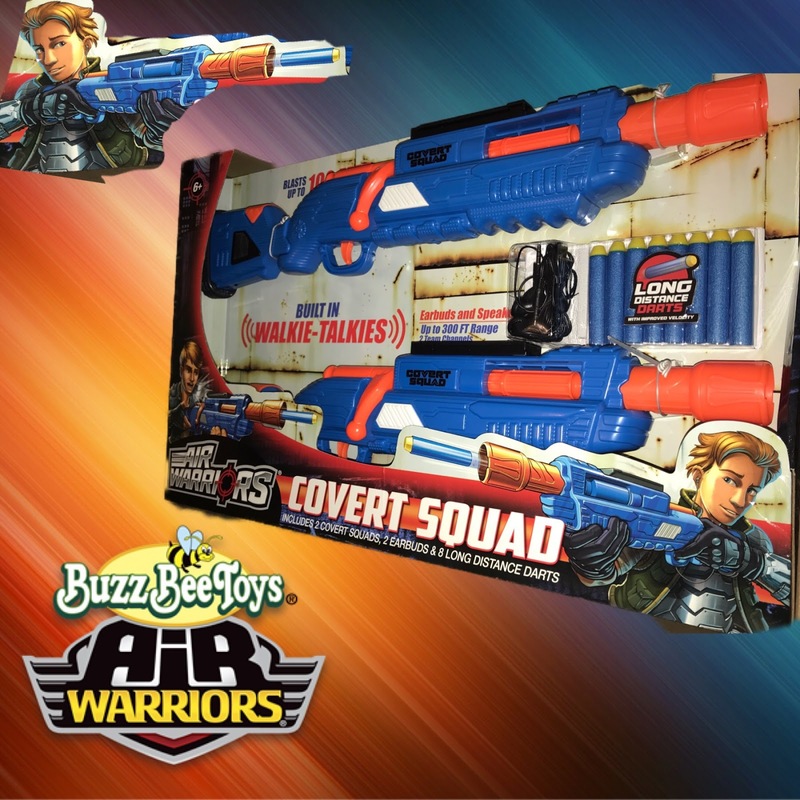 Look for my giveaway coming next week featuring Air Warriors Covert Squad Dart Blasters from Buzz Bee Toys! Buzz Bee Toys Air Warriors Covert Squad dart blasters allow you and a friend to stay in secret communication while in pursuit of your target. Each dart blaster features realistic bolt loading action and blasts darts up to 100 feet away. With a range of up to 300 feet, the Walkie Talkies keep you in communication with your team mate. With a simple press of the talk button, connect with your team mate while your target is on the move. Each dart blaster comes with a set of earbuds so that only your team mate can hear what you are saying. The Walkie Talkies have are two channels for multiple team play. diff4 "AA" batteries are required. Item includes two darts blasters, 8 long distance darts and 2 sets of ear buds. Recommended for children 6 years of age and older. Disclosure: I received this product to review for my honest personal opinion. My youngest nephew would no doubt get a kick out of this. I've never seen one with walkie talkes before. My son would enjoy this toy. He always gets his niece a Nerf gun for Christmas so they can play together.